Aristotle and Plato were philosophers in ancient Greece who critically studied matters of ethics, science, politics, and more. Though many more of Plato's works survived the centuries, Aristotle's contributions have arguably been more influential, particularly when it comes to science and logical reasoning. While both philosophers' works are considered less theoretically valuable in modern times, they continue to have great historical value. Plato influenced Aristotle, just as Socrates influenced Plato. But each man's influence moved in different areas after their deaths. Plato became the primary Greek philosopher based on his ties to Socrates and Aristotle and the presence of his works, which were used until his academy closed in 529 A.D.; his works were then copied throughout Europe. For centuries, classical education assigned Plato's works as required reading, and The Republic was the premier work on political theory until the 19th century, admired not only for its views, but also for its elegant prose. Aristotle and his works became the basis for the both religion and science, especially through the Middle Ages. In religion, Aristotelian ethics were the basis for St. Thomas Aquinas' works that forged Christian thought on free will and the role of virtue. Aristotle's scientific observations were considered the last word in knowledge until about the 16th century, when Renaissance thought challenged and eventually replaced much of it. Even so, Aristotle's empirical approach based on observation, hypothesis and direct experience (experimentation) is at least part of the basis for scientific activity in nearly every field of study. Whereas most of Plato's works have survived through the centuries, roughly 80% of what Aristotle wrote has been lost. He is said to have written almost 200 treatises on an array of subjects, but only 31 have survived. Some of his other works are referenced or alluded to by contemporary scholars, but the original material is gone. What remains of Aristotle's works are primarily lecture notes and teaching aids, draft-level material that lacks the polish of "finished" publications. Even so, these works influenced philosophy, ethics, biology, physics, astronomy, medicine, politics, and religion for many centuries. His most important works, copied hundreds of times by hand throughout ancient and medieval times, were titled: Physics; De Anima (On the Soul); Metaphysics; Politics; and Poetics. These and several other treatises were collected in what was called the Corpus Aristotelicum and often served as the basis for hundreds of private and teaching libraries up to the 19th century. Plato's works can be roughly divided into three periods. His early period featured much of what is known about Socrates, with Plato taking the role of the dutiful student who keeps his tutor's ideas alive. Most of these works are written in the form of dialogues, using the Socratic Method (asking questions to explore concepts and knowledge) as the basis for teaching. Plato's The Apology, where he discusses the trial of execution and his teacher, is included in this period. Plato's second or middle period is comprised of works where he explores morality and virtue in individuals and society. He presents lengthy discussions on justice, wisdom, courage, as well as the duality of power and responsibility. Plato's most famous work, The Republic, which was his vision of a utopian society, was written during this period. The third period of Plato's writings mainly discusses the role of arts, along with morality and ethics. Plato challenges himself and his ideas in this period , exploring his own conclusions with self-debate. The end result is his philosophy of idealism, wherein the truest essence of things occurs in thought, not reality. In The Theory of Forms and other works, Plato states that only ideas are constant, that the world perceived by senses is deceptive and changeable. Plato believed that concepts had a universal form, an ideal form, which leads to his idealistic philosophy. Aristotle believed that universal forms were not necessarily attached to each object or concept, and that each instance of an object or a concept had to be analyzed on its own. This viewpoint leads to Aristotelian Empiricism. For Plato, thought experiments and reasoning would be enough to "prove" a concept or establish the qualities of an object, but Aristotle dismissed this in favor of direct observation and experience. In logic, Plato was more inclined to use inductive reasoning, whereas Aristotle used deductive reasoning. The syllogism, a basic unit of logic (if A = B, and B = C, then A = C), was developed by Aristotle. Both Aristotle and Plato believed thoughts were superior to the senses. However, whereas Plato believed the senses could fool a person, Aristotle stated that the senses were needed in order to properly determine reality. An example of this difference is the allegory of the cave, created by Plato. To him, the world was like a cave, and a person would only see shadows cast from the outside light, so the only reality would be thoughts. To the Aristotelian method, the obvious solution is to walk out of the cave and experience what is casting light and shadows directly, rather than relying solely on indirect or internal experiences. The link between Socrates, Plato, and Aristotle is most obvious when it comes to their views on ethics. Plato was Socratic in his belief that knowledge is virtue, in and of itself. This means that to know the good is to do the good, i.e., that knowing the right thing to do will lead to one automatically doing the right thing; this implied that virtue could be taught by teaching someone right from wrong, good from evil. 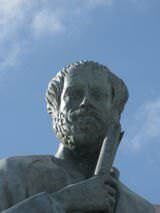 Aristotle stated that knowing what was right was not enough, that one had to choose to act in the proper manner—in essence, to create the habit of doing good. This definition placed Aristotelian ethics on a practical plane, rather than the theoretical one espoused by Socrates and Plato. For Socrates and Plato, wisdom is the basic virtue and with it, one can unify all virtues into a whole. Aristotle believed that wisdom was virtuous, but that achieving virtue was neither automatic nor did it grant any unification (acquiring) of other virtues. To Aristotle, wisdom was a goal achieved only after effort, and unless a person chose to think and act wisely, other virtues would remain out of reach. Socrates believed that happiness could be achieved without virtue, but that this happiness was base and animalistic. Plato stated that virtue was sufficient for happiness, that there was no such thing as "moral luck" to grant rewards. Aristotle believed that virtue was necessary for happiness, but insufficient by itself, needing adequate social constructs to help a virtuous person feel satisfaction and contentment. It is worth noting that Greek views on these issues were more attuned to Aristotle's views than either to Plato's or Socrates' during their lifetimes. Plato's contributions to science, as that of most other Greek philosophers, were dwarfed by Aristotle's. Plato did write about mathematics, geometry, and physics, but his work was more exploratory in concept than actually applicable. Some of his writings touch on biology and astronomy, but few of his efforts truly expanded the body of knowledge at the time. 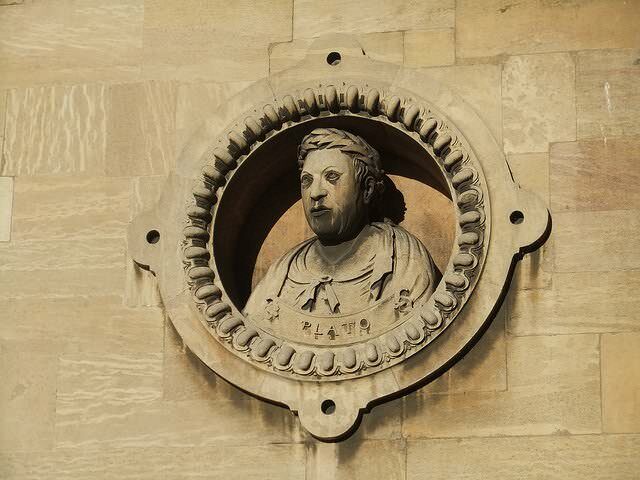 On the other hand, Aristotle, among a few others, is considered to be one of the first true scientists. He created an early version of the scientific method to observe the universe and draw conclusions based on his observations. Though his method has been modified over time, the general process remains the same. He contributed new concepts in math, physics and geometry, though much of his work was basically extensions or explanations of emerging ideas rather than insights. His observations in zoology and botany led him to classify all types of life, an effort that reigned as the basic biology system for centuries. Even though Aristotle's classification system has been replaced, much of his method remains in use in modern nomenclature. His astronomical treatises argued for stars separate from the sun, but remained geocentric, an idea that would take Copernicus would later overthrow. In other fields of study, such as medicine and geology, Aristotle brought new ideas and observations, and though many of his ideas were later discarded, they served to open lines of inquiry for others to explore. Plato felt that the individual should subsume his or her interests to that of society in order to achieve a perfect from of government. His Republic described a utopian society where each of the three classes (philosophers, warriors, and workers) had its role, and governance was kept in the hands of those deemed best qualified for that responsibility, those of the "Philosopher Rulers." The tone and viewpoint is that of an elite taking care of the less capable, but unlike the Spartan oligarchy that Plato fought against, the Republic would follow a more philosophical and less martial path. Aristotle saw the basic political unit as the city (polis), which took precedence over the family, which in turn took precedence over the individual. Aristotle said that man was a political animal by nature and thus could not avoid the challenges of politics. In his view, politics functions more as an organism than as a machine, and the role of the polis was not justice or economic stability, but to create a space where its people could live a good life and perform beautiful acts. Although eschewing a utopian solution or large-scale constructs (such as nations or empires), Aristotle moved beyond political theory to become the first political scientist, observing political processes in order to formulate improvements. Though Plato and Aristotle have become directly linked to philosophy and the height of Greek culture, their works are studied less now, and much of what they stated has been either discarded or set aside in favor of new information and theories. For an example of theory espoused by Aristotle and Plato that is no longer considered valid, watch the video below regarding Plato and Aristotle's opinions on slavery. To many historians and scientists, Aristotle was an obstacle to scientific progress because his works were deemed so complete that no one challenged them. The adherence to using Aristotle as "the final word" on many subjects curtailed true observation and experimentation, a fault that lies not with Aristotle, but with the use of his works. Among Islamic scholars, Aristotle is "the First Teacher," and many of his recovered works may have been lost if not for Arabic translations of the original Greek treatises. It may be that Plato and Aristotle are now more starting points on analytical paths than endpoints; however, many continue to read their works even today. Plato was born around 424 B.C. His father was Ariston, descended from kings in Athens and Messenia, and his mother, Perictione, was related to the great Greek statesman, Solon. Plato was given the name Aristocles, a family name, and adopted Plato (meaning "broad" and "strong") later when he was a wrestler. As was typical of upper middle-class families of the time, Plato was educated by tutors, exploring a wide range of topics centered largely on philosophy, what would now be called ethics. He became a student of Socrates, but his studies with the Greek master were interrupted by the Peloponnesian War, which pit Athens against Sparta. Plato fought as a soldier between 409 and 404 B.C. He left Athens when the city was defeated and its democracy was replaced by a Spartan oligarchy. He considered returning to Athens to pursue a career in politics when the oligarchy was overthrown, but the execution of Socrates in 399 B.C. changed his mind. For over 12 years, Plato traveled throughout the Mediterranean region and Egypt studying mathematics, geometry, astronomy, and religion. In about 385 B.C., Plato founded his academy, which is often suggested to have been the first university in history. He would preside over it until his death around 348 B.C. Aristotle, whose name means "the best purpose," was born in 384 B.C. in Stagira, a town in northern Greece. His father was Nicomachus, the court physician to the Macedonian royal family. Tutored privately as all aristocratic children were, Aristotle trained first in medicine. Considered to be a brilliant student, in 367 B.C. he was sent to Athens to study philosophy with Plato. He stayed at Plato's Academy until about 347 B.C. Although his time at the academy was productive, Aristotle opposed some of Plato's teachings and may have challenged the Master openly. When Plato died, Aristotle was not appointed head of the academy, so he left to pursue his own studies. After leaving Athens, Aristotle spent time traveling and studying in Asia Minor (what is now Turkey) and its islands. At the request of Philip of Macedon, he returned to Macedonia in 338 B.C. to tutor Alexander the Great, and two other future kings, Ptolemy and Cassander. Aristotle took full charge of Alexander's education and is considered to be the source of Alexander's push to conquer Eastern empires. After Alexander conquered Athens, Aristotle returned to that city and set up a school of his own, known as the Lyceum. It spawned what was called the "Peripatetic School," for their habit of walking around as part of their lectures and discussions. When Alexander died, Athens took arms and overthrew its Macedonian conquerors. Because of his close ties to Macedonia, Aristotle's situation became dangerous. 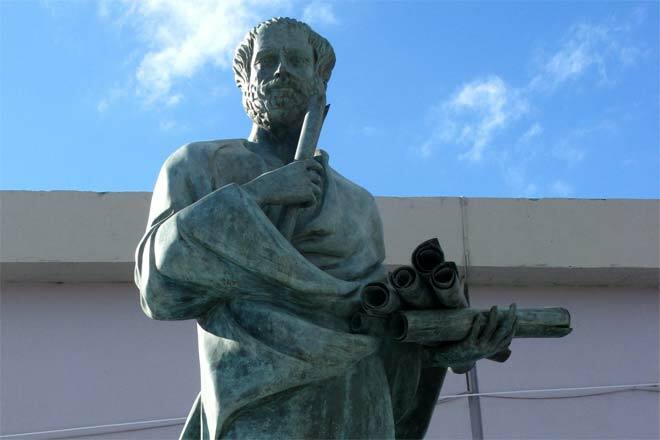 Seeking to avoid the same fate as Socrates, Aristotle emigrated to the island of Euboea. He died there in 322 B.C. The reference to Plato's 2nd letter, concerning Plato's dialogues representing a "Socrates cleansed and beautified" or "beautified and rejuvenated" (somce translations say "modernized") is not at 341c, but, rather, 314c.